Metal-crunching chords of Hard Copy cybermusic grind through the thrash-hall crowd of bongs and sprawl kids. At times both perverse and lackadaisical, the members of Philanthropic Epitaph plow through their mind-bending set of Hard Copy psycha-rock. At the back of the club, four members of The Cat House, a San Francisco subterfuge team, plot their next corporate strike. Winding their way through the throng of gyrating dancers are a host of other noteworthy personalities. Today the actions of these people span the sewer lines and the conference rooms, but they'll all wind up in the Body Bank. Someday. 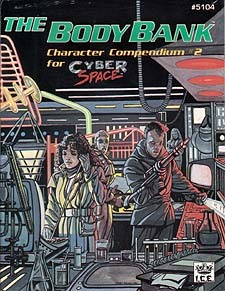 This Cyberspace Character Compendium provides YOU with a number of down and dirty NPCs, ready to be tossed into any cyber campaign. An artist's rendering depicts each personality in The Body Bank - 16 of them in Full Colour. * Personal Data: Looks, demeanor, background and undertakings are provided in concise text. * Stats & Specs: Each character is given his or her game statistics, modifiers, combat specs and more.